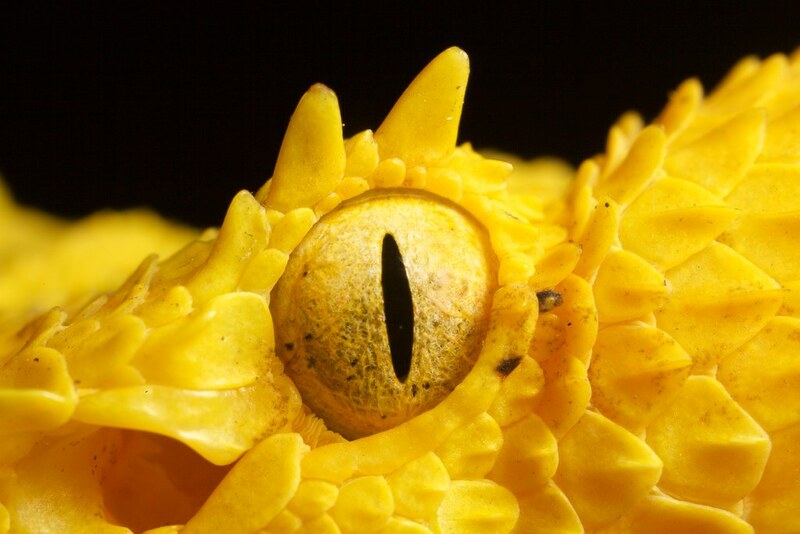 Extreme close-up of one of the most beautiful snakes in the world – the golden eyelash pit viper (Bothriechis schlegelii). Though it comes in several colour phases, the most striking is undoubtedly the golden morph. With the pronounced superciliary scales above the eye it is easy to see how the snake earned its name. This shot was taken in the wild in La Selva biological station adjoining Braulio Carillo national park, Costa Rica. So, I say that I’m going to start writing my blog again and then days, even weeks pass. I don’t call, I don’t write. You’d be forgiven if you called me a deadbeat blogger. Well, not quite but I’ll let that one slide. I’ve finally arrived in Costa Rica after having spent much too long in convalescence and the warm rush of night air that assails me as I step off the plane is a welcome change to the frigid Canadian air. Unlike my more adventurous days in Thailand and Borneo when I stepped off the plane at 11PM, took the bus and wandered several hours in the street at ungodly hours looking for a hostel while being constantly accosted by transvestite hookers, this time ’round I grabbed a taxi. Straight to the hostel with a little wandering around, but no adventures I’m afraid. The following day I opted to take off right away rather than spend a rest day in San Jose, so I kitted up with dry soups, rice and tuna and headed for the Tracopa bus depot to Buenos Aires. Fortunately the buses are respectable, somewhere between the economy and deluxe class of their South American counterparts. From B.A. I took another bus to Las Tablas; however, buses tend to have a narcoleptic effect on me and so I fell asleep about 20 minutes into the ride. Rubbing the sleep from my eyes about an hour and half later, when I asked how much longer to Las Tablas the other passengers looking out the rear window pointed and jabbered at me in their strong Tico accents. I gathered that we’d passed it at least 30 minutes ago. I hurried off the bus was letting off the last of several passengers in a small town. I motioned to the driver to get my bag, told him I was supposed to go to Las Tablas. Again received some indecipherable harangue before he dropped the bag at my feet and mounted the bus. Still groggy and somewhat out of sorts I couldn’t help but feel like I was missing something. I’ve got my backpack, my shoulder bag…oh, OH! I pounded on the bus that was pulling away with the one bag packed with expensive camera gear stowed in the overhead above my seat (Now I never usually do that, not just for this reason that I might forget it, but it is also pretty welcoming to thieves). The bus gained speed, looked like it was about to take off unheeding of my frantic poundings, but finally stopped, and with it my heart. I reached the front doors limping and told the driver that I still had a bag onboard. As I mounted the steps he chided me discouragingly and said that he would get it if I could kindly describe the bag. Breathlessly I described it and he returned a minute later holding my precious cargo. Accepting it I sagged into the ground, a puddle of relief. Now of course I was in some town that never counted on being in, no real idea where I was and the last of the buses going back in the direction of Las Tablas had already left (or so the admonishing bus driver and vulturish taxi drivers told me). Eschewing the cheaper option of just staying put I let myself be persuaded to take a taxi all the way to Altamira (About the price of a cheap flight I got totally screwed yet again by a taxi driver quoting first American and then Costa Rican currency). Nevertheless it took the guesswork out of taking several buses the following day and it did turn out to be about an hour, most of it along an unsealed road. Night falls and I manage to adhere to plan of reaching the park, only just! I had finally made it to this ‘remote’, ‘isolated’, ‘off the beaten track’ station only to find that they had power, water and any number of utilities which rendered the majority of my survival gear redundant. The tears of bitterness were a bitter draught that did nothing to assuage my seemingly unquenchable thirst.